This is an update of a chart I have published a couple of times. The Obama Administration in the past couple of years has threatened at various times that a) the sequester and b) the government shutdown would have a devastating impact on employment. Here is the most recent job addition data (I would prefer just private job changes but this is public and private, via here). The media published 6 zillion articles worrying or outright predicting in advance that the government shutdown would hurt the economy and destroy private employment. No such thing appears to have happened. But of course the media never, ever, ever goes back and retrospectively revisits predictions of doom gone wrong. Interesting take ... I have always held the view that anything interrupting or even the perception of mitigating government interference in the economy will set in motion economic activity that is positive. 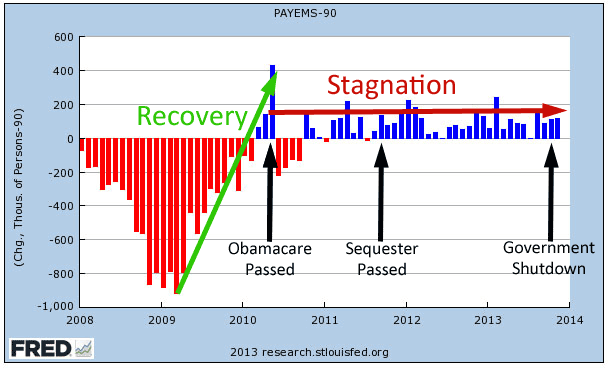 By the same token any efforts by the government, even taking credit for magical new jobs stats will screw things up. The economy will always try to advance in spite of all the efforts of idiot regulators and their political masters to interfere and that is why any real initiatives to free up the market place by removing taxes or regulation are so effective at creating wealth. Sadly ... we are inflicted with many economic theorists who have no grasp of the fundamentals and politicians who are basically self serving parasites. "I've been running the media's reporting departments for decades, my dear"